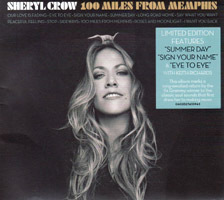 Great memphis-soul album from our favourite rock'n'roll girl Sheryl Crow. It is clearly one of her best and most easily enjoyable outputs for a while and it has everything from great melodies to true emotional soul. 100 Miles From Memphis takes no time at all to get into, in fact you'll like it instantly. However much I hate Justin Timberlake, I have to admit that Sign Your Name (Terence Trent D’Arby cover) is very good. Eye to Eye has Keith Richards on guitar and obviously that doesn't hurt the quality. Sheryl however, does absolutely fine on her own and the best song on the album is the title track 100 Miles From Memphis. Sheryl doesn't get much better than that. If you've ever liked anything by Sheryl, you'll love this song. It is simply perfect. The limited edition cd has an extra track I Want You Back (Jackson 5 cover) that is okay, but nothing you have to kill for. I never really liked Mr. D’Arby. Never thought he was worthy of using the Trent name. :) So maybe you should ask a D’Arby fan if it is okay or not. I like it. Interesting - I might wanna hear this one. However...doing sign your name...I find it hard to believe that it's anywhere close to being as good as the original.